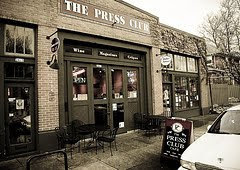 Wednesday, December 16th, at 7:30 p.m, Mountain Writers is hosting a reading by Carlos Reyes and Lex Runciman at The Press Club (2621 SE Clinton, Portland). Sunday, December 20th from 11:00 a.m. to 6:00 p.m. at the Cleaners at the Ace Hotel, there will be a publication fair, sponsored by Publication Studio. According to their web site, the fair will be “an old-fashioned fair, like 4-H but with books instead of livestock.” Participants include Pinball Publishing, Marriage Records, Octopus Books and many others. Publication Studio was founded by Matthew Stadler.